During construction, your project's demands on your organization remain intensive, but they shift in nature. 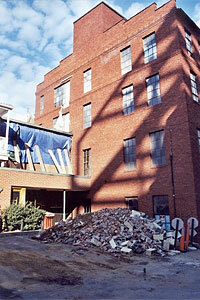 Recycling your project's construction waste is one way to "green" your building project. before construction begins. They can be done "in house" by staff or volunteers or "out of house" by professionals, such as construction managers or others. It is also important during this stage to make sure that you, or your architect or other representative, make sure that the building materials and products being used are actually the green products called for in your building plan. Because these materials are relatively new to the market, we have found that some builders replace the green materials specified in building plans with conventional building materials. We recommend that you ask your architect and builder what steps they can take to make sure that the proper materials go into your new building. Throughout the construction phase, there will often be a need to consider (and approve or not) possible changes to what you have planned. Sometimes these arise, in the case of renovations, from the discovery of conditions previously unknown (for example, a weight-bearing beam has unexpectedly deteriorated). Sometimes these will arise from suggestions made by the architect, and sometimes from changes in what you as client desire. Once again, think through beforehand how and by who such "change orders" will be made, realizing that the handling of change orders often impacts whether or not a project come in on budget. Remember in budgeting for your project to build in contingency funds for such changes. Meanwhile, your fundraising continues. Support your fundraising efforts with timely communications of the progress of the project to your community. This can be through your regular newsletters. It can take the form of special "letters" from your ordained leader or from the project's volunteer leaders or the leaders of your fundraising effort. It can be updates on your web site. Remember that pictures--of the project as it is built, of the people associated with the project--have a special impact. Consider setting up several walk-throughs of the construction site, both for groups and for individual donors or perspective donors. Make sure to point out the green features of your project during these tours. People love to put on those hard hats! Finally, keep your stakeholders outside your organization informed as well. Press releases to local and regional news organizations, as well as publications targeted to your denomination or constituency are a great way to publicize the green dimensions of your efforts. Your wider community will admire your green project. You'll find that many of them will want to talk with you about how to go green.